I am Jasmine, an angel in white uniform, born in Kyaut Me, Northern Shan State. I have a younger brother. With a farmer family, I stayed in Kyaut Me until high school. While studying in high school, my family ran a sugarcane plantation. The business fell apart, however, when the price of sugarcane fell. All of the family members had to move to another town with so many debts. It was a reason that I had to drop my high school for two years. 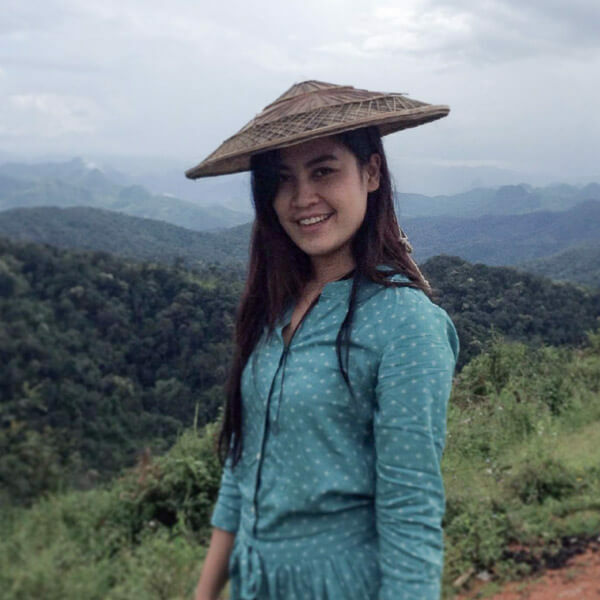 Due to the family’s unstable living condition, I was sent to stay with my auntie in Taunggyi, Southern Shan State. I have become a stronger and much more mature young woman since having to stay apart from my parents and little brother. I told myself not only to understand such circumstances, but to learn to fight forward by staying with unfamiliar environments and people. I learned a lot in terms of social dealings and developed myself as an early adult in that period of time in Taunggyi. A year and half later something suddenly popped into my mind that led me to change: a higher education. Only a good education could bring a better life and a better future, and allow me to build a happier and healthier community. But I needed a high school diploma, so I planned to go back to high school. I started to collect money little by little whenever I got pocket money from my aunt. I made a promise to myself not to buy new clothes. I didn’t even dare buy a box of milk. The hard time in my life was not over yet. Since I decided to continue my high school, my father sent me to Mandalay, the middle part of Myanmar, for an intensive high school course that lasted a few months. After that, my family sent me to Yangon where I stayed at a close friend of my father’s house. Fortunately, I got a chance to prepare for my high school. In March 2004, when I was 19, I earned a matriculation certificate from my high school. After high school, I joined the Shan Culture Center as a volunteer teacher, teaching Shan children the Shan language and culture in my hometown, Kyaut Me. The reason I am applying Zomia is to help me financially. I really want to focus on my studies and activities with no concern and stress about my finances. Since I only need one more year to finish school, Zomia would really benefit me. The words “never give up and work smart” always motivated me to keep my head up and focus. In 2009, I became a much stronger woman when I arrived in Thailand, again due to family financial problems. Arriving to Thailand was the first time leaving our motherland. It was difficult to adopt the culture, food and especially Thai language. It was a painful and scary experience arriving to another country without any legal documents, trying to find a job, and avoiding the police. In October and November I voluntarily taught Shan and Burmese language conversation for migrants at a migrant learning center in Chiang Mai, Thailand. A few months later, while my little brother and I were unemployed, we found a learning center for migrants to learn the Thai language. Fortunately, my little brother and I were able to make contact with an uncle who had worked with the Shan Health Committee (SHC). This NGO later gave me an opportunity to learn more English and computers. Both of us didn’t work due to the help of my uncle. Instead we started learning English and computers while we were interning. Arriving to a more developed country and seeing higher standards and educated people opened my mind to push myself forward and have a better education. With my motivation, I kept searching for the opportunity and found myself at Bridging Educational Access to Migrants (BEAM). A year of studying at BEAM opened up my eyes which were closed. Then, I chose to study higher education and healthcare for the grassroots people in my society in my future. Finally, I am now studying in my third year of Bachelor of Nursing Science at Assumption University. There is only one more year in order to graduate. Written by Jasmine with editing assistance from Zomia’s volunteer editors. I have two hands: one to help myself and another for my family, friends, and surroundings. It is all about happiness and passion. I love being a nurse and I love helping people with no expectation of a return.